Despite being at the top of the Eastern Conference, and one of the best teams in the NHL for most of the season, one area that has noticeably been a problem for the New York Rangers is the power play. Before Sunday’s tilt with the Islanders, the Rangers were 29th in the league in power play percentage. 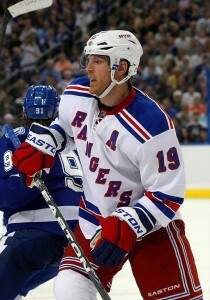 Among other things, being a quarterback on the power play was one of the reasons that the Rangers made a hard push for Brad Richards during the off-season. Yet despite the numerous combinations that coach John Tortorella has used on the power play this season, the results have been largely the same. In the Rangers’ last game against the Islanders, the play of Richards, along with the play of call-up Mats Zuccarello that brought the power play to life. The Rangers power play went 3-for-6, with Richards recording two power play goals, and setting up Marian Gaborik’s power play goal in overtime. Unlike at other points throughout the season, Richards took control of the power play. Richards took four out of the Rangers eleven shots on the power play, and his first goal was indicative of the control he had, carrying the puck on an end-to-end rush, and firing a wrist shot past Evgeni Nabokov. As the Rangers enter the home stretch of the season and the playoffs that will follow, the special teams will become more important. In order to be more successful than the 14.8% that the Rangers have scored on the power play, Richards and Zuccarello will need to contribute the way they did against the Islanders.